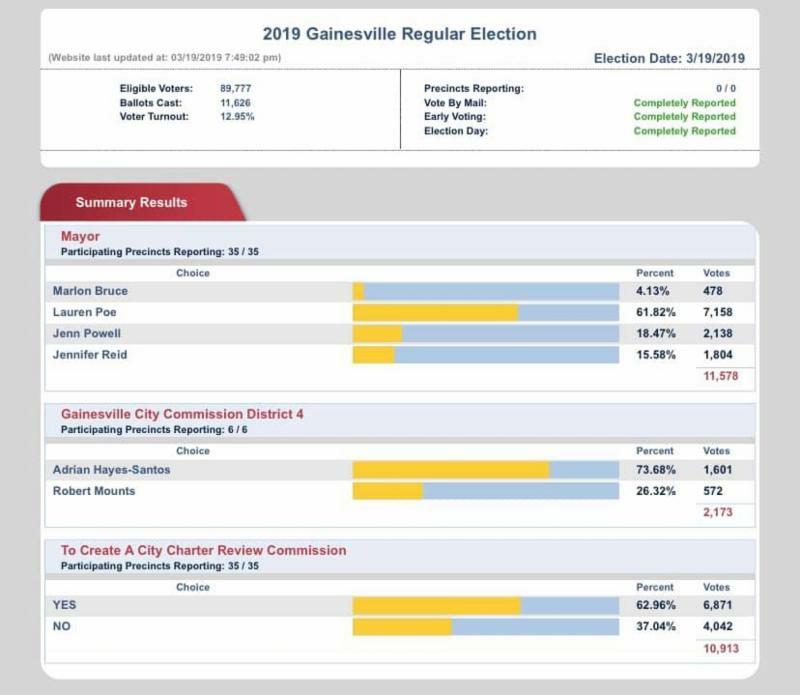 The 2019 City of Gainesville Regular Election has come and gone, and we are all very proud of the work that everyone put into making the election a success. If you live in a municipality in Alachua County, do not forget that your municipality may be having an election this year. Take a look at our election calendar if you're not sure. Both the City of Alachua and the City of Newberry have elections on April 9. Polls in those cities will be open from 7 a.m. to 7 p.m.
My team and I look forward to working hard this year and next to make sure that Alachua County's 2020 election cycle is as successful as possible. Encourage friends and family to consider working the 2020 election cycle. Election workers are paid for their service. 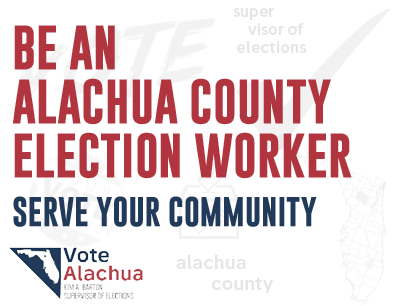 For more information, go to https://www.votealachua.com/Poll-Workers/Become-a-Poll-Worker . 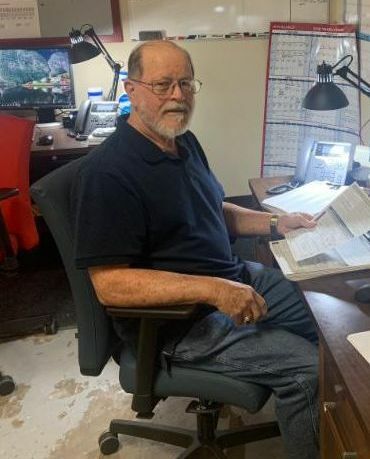 April 11 at 11:30 a.m.
April 18 at 11 a.m.
April 27 | 9 a.m. to 5 p.m.
April 30 at 10 a.m.
Eugene Derfinyak is an on-call elections operations technician who assists with the election equipment setups, diagnostics, and sorting documents and papers for the elections. Eugene started working at the Supervisor of Elections office in January 2016. He says his favorite part about his position is working to make sure that everything is ready for voters. Outside of work, he enjoys photography, cooking and studying genealogy. During the 2019 City of Gainesville Regular Election, we achieved 100 percent transmission of election results from polling places to our main office. Unofficial results from all precincts, as well as early voting and vote-by-mail ballots, were posted by 8:30 p.m.
Congratulations to the Vote Alachua Team members who made this possible! 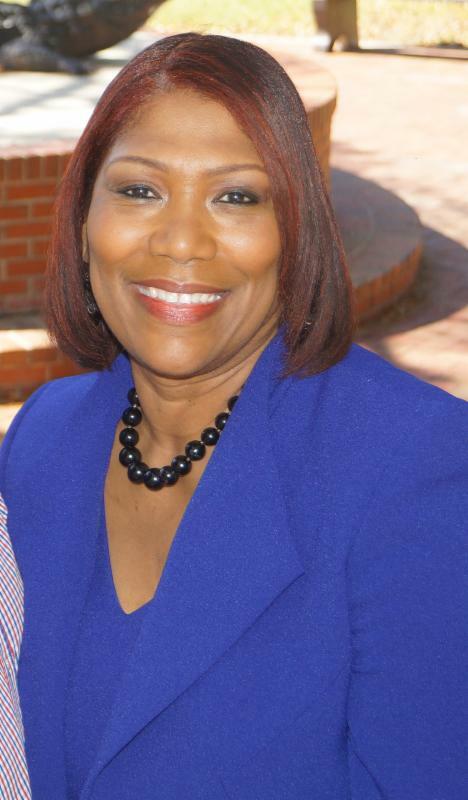 Supervisor Barton attended Mt. 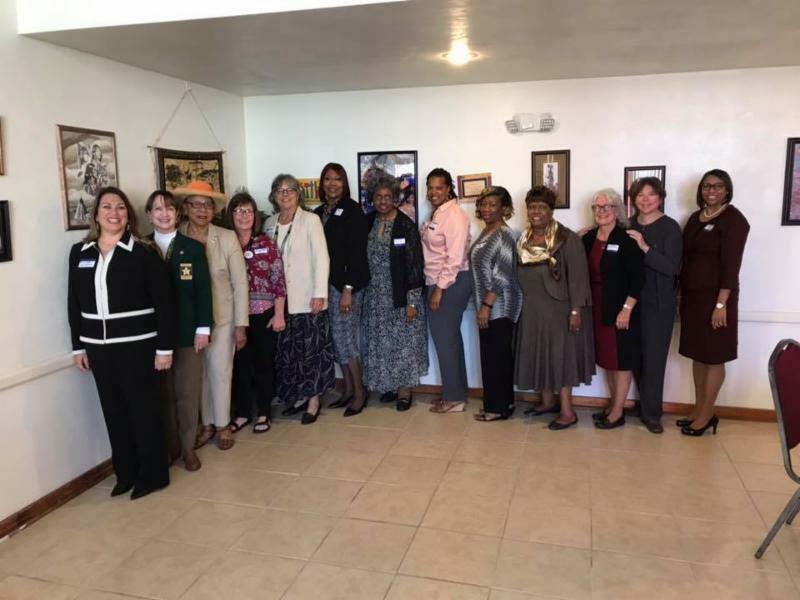 Pleasant United Methodist Church's Elected Women for Such a Time as This Prayer Breakfast in March. 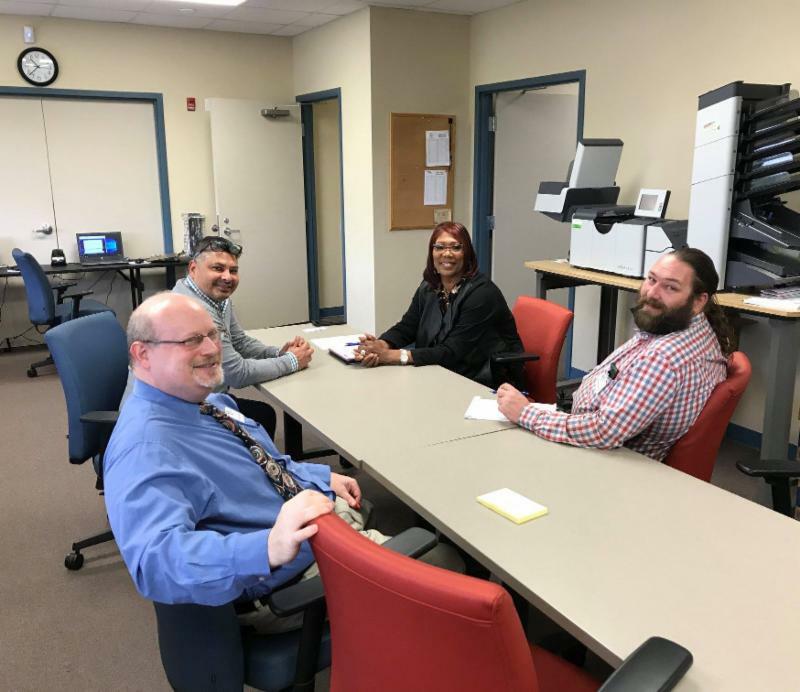 Supervisor Barton, Chief Deputy Will Boyett and Vote-by-Mail Coordinator Mike Bruckman met with US Postal Service official Noah Escobar in March. ﻿The main topic? Preparing for 2020! 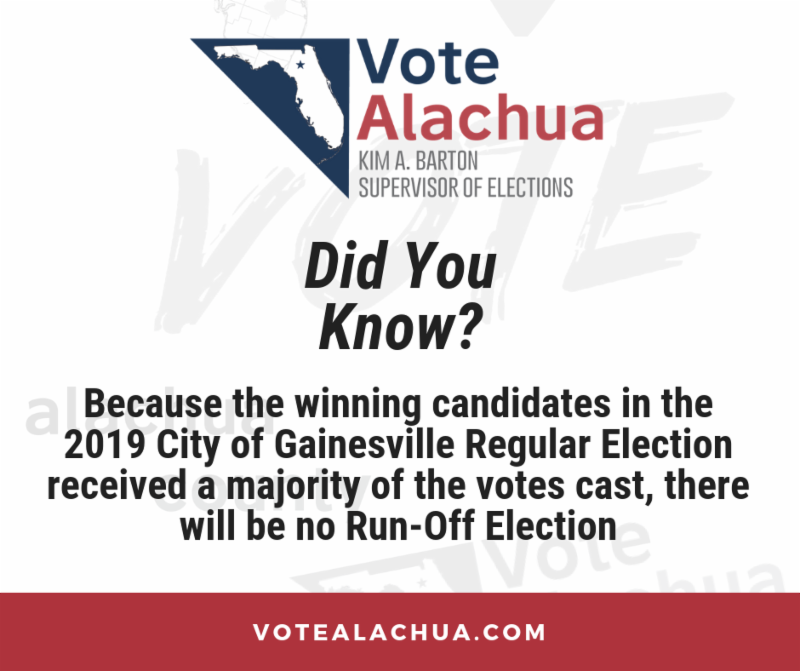 With both winning candidates receiving a majority of the vote in the 2019 City of Gainesville Regular Election, there will not be a run-off election. Our office is always willing and able to do presentations and attend community outreach events. 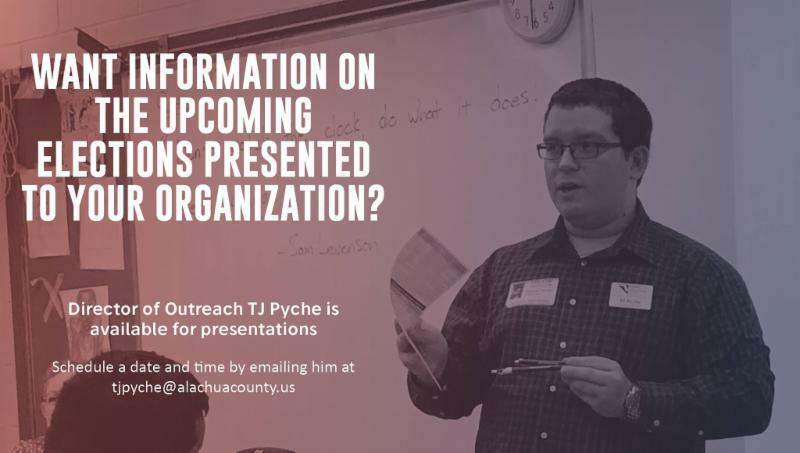 For more information or to schedule a visit from our office, email Director of Outreach TJ Pyche at tjpyche@alachuacounty.us . Vote-by-mail ballot requests are valid through two General Elections. 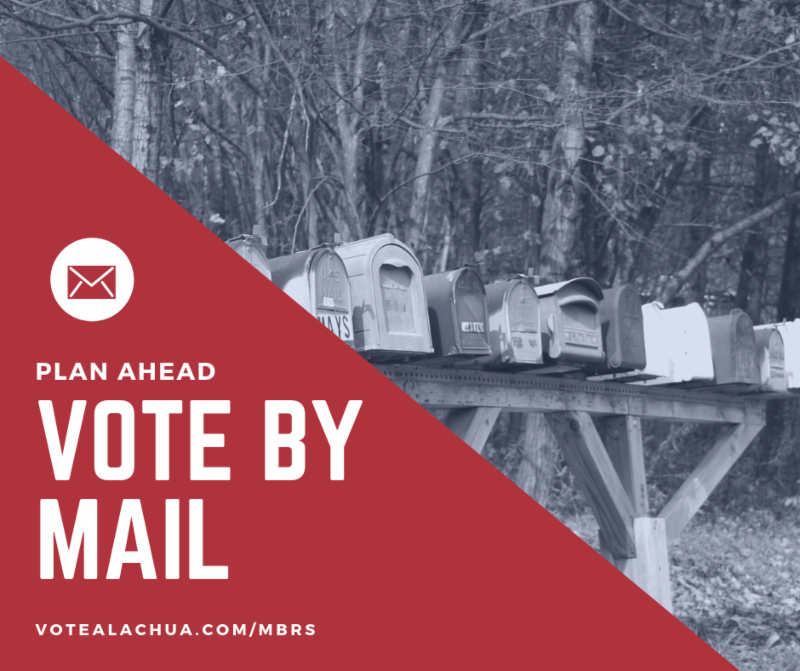 Make sure you renew your vote-by-mail ballot request for the 2020 election cycle at VoteAlachua.com/MBRS .